The law is complicated, and everyone makes mistakes. Here’s what you need to know about malpractice insurance and reporting a matter should a mistake give rise to a malpractice claim. Malpractice is one of a lawyer’s everyday worries. Failing to communicate regularly with clients, missing court dates or statutes of limitation, and failing to identify conflicts of interest are only a few of the malpractice dangers Wisconsin lawyers face. Malpractice insurance (also known as professional liability insurance) is an insurance policy that lawyers purchase to defend against and provide coverage for malpractice claims brought by clients and some third parties that may have standing under case law or statute. As described in the definition below, malpractice is when a lawyer has “screwed up” (or so a party may claim). Malpractice: The delivery of substandard care or services by a lawyer, doctor, dentist, accountant or other professional. Generally, malpractice occurs when a professional fails to provide the quality of care that should reasonably be expected in the circumstances, with the result that her patient or client is harmed. In the area of legal malpractice, you need to prove two things to show that you were harmed: first, that your lawyer screwed up; and second, that if the lawyer had handled the work properly, you would have won your original case. Why do I need malpractice insurance? Malpractice insurance usually provides for defense of any claim and payment of claims up to the limit of the policy. Many malpractice insurance providers also provide resources, articles, forms, and even continuing legal education to help their customers manage malpractice risks. While malpractice insurance is not required, the State Bar’s Practice411™ considers maintaining malpractice insurance to be a “best practice”: it shows that you are serious about protecting your client’s interests if you make a mistake, rising to the level of malpractice, that cannot otherwise be corrected. org practicehelp wisbar Nerino J. Petro Jr., Northern Illinois 1988, is the advisor to the State Bar of Wisconsin Law Office Management Assistance Program (Practice411™). 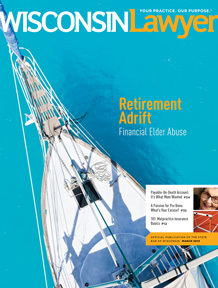 Joe McCarthy, vice president of underwriting, WILMIC, contributed to this article. Malpractice insurance policies are “claims made” policies: these types of policies protect you for wrongful acts that occur and are reported to your malpractice insurance provider during the period that the malpractice policy is in continuous force, as well as any acts that first occurred during a retroactive or extended reporting period provided for in the policy itself. For example, if your policy is in effect for 2013 and has a retroactive date of June 1, 2011, if a claim is made in 2013 for a malpractice that occurred in March 2012, your current policy provider for 2013 will defend you (assuming the claim does not fall within one of the policy exclusions). If the claim is for malpractice that first occurred in May 2011, your current provider will not defend you because the malpractice occurred outside of the retroactive or extended reporting period. Claims made policies differ from occurrence-based insurance policies for commercial or personal liability and casualty policies. Under occurrence-based policies, you submit the claim to the insurance provider in place on the date of the injury. That is, if the act occurred in 2001, you would look to the insurance provider that provided coverage for you in 2001, not 2013. Your malpractice insurance premium may be based on several factors, including how many lawyers are in your firm and how many of them will be insured; how many years you have been practicing law; the amount of coverage you are seeking and the annual deductible amount you request; whether you have systems in place to minimize potential malpractice risk; and any recent claims. Premiums may also be influenced by the areas of practice in which you are involved. Some areas of practice are subject to a higher risk of claims, either in frequency or in severity. The corresponding premium to cover those areas may be higher as a result. Finally, some carriers charge lower premiums for a part-time practice than for a full-time practice. The economic impact may be significant, particularly for those lawyers just starting up a new practice. It would be great to open a new practice and to immediately be working “full time.” However, it’s more likely that a new practice requires time for administrative, marketing, and other business activities that take away from the amount of time actually spent practicing law. A few insurance companies take this into consideration and will rate the practice as part time. What’s on your mind? Email your “101” topic ideas to org wislawyer wisbar wisbar wislawyer org or post a comment at the end of this article. The cost of malpractice insurance increases over time. When you first start practicing, there is little risk because you have no clients from the past that could potentially discover malpractice and file suit. However, this changes as you build your practice and gain more clients. The likelihood of a claim being made at the time of representation is small; it’s after the end of the representation and time passes that the likelihood of a claim increases. So, generally speaking, your insurance premium will increase each year for the first five years because of the additional potential exposure. As an example, Wisconsin Lawyers Mutual Insurance Co. (WILMIC) uses five years as the general set point for flattening out increases in its policies as each additional year increases the risk of a claim being made. Any risk from year one is added to year two and then year three, and so on. The more cases or files you have, the greater the pool of potential malpractice claims. Insurance providers may include other factors or change their method of determining premiums, so you should inquire as to this process when you are shopping for coverage. For a claims made policy, the risk of a claim includes not only the current year but also all the prior years of your practice (subject to any retroactive date). So as time goes by, your malpractice insurance premium covers all work that you have done since the retroactive date (determination of which is part of the policy application process). Furthermore, when a claims made policy expires, all coverage ceases, even for work you did while the policy was in force. The increased premium in subsequent policies reflects the increased exposure because it covers more years of practice. The commonly used term tail coverage refers to what is technically known as an “extended reporting period (ERP) endorsement.” The ERP endorsement simply extends the time in which someone can make a claim. The endorsement attaches to the most recent policy on which a lawyer is identified as an insured. Any lawyer leaving a firm by way of retirement or simply changing jobs should consider purchasing this type of endorsement. Many professional liability policies provide coverage as a matter of course to a “former lawyer,” particularly when a lawyer leaves a firm and continues to practice elsewhere. However, lawyers should determine if they need to purchase this endorsement to ensure the work they have done in the past continues to be covered by that firm’s policy. Lawyers who are retiring also should consider purchasing the ERP endorsement. The endorsements can be purchased to provide coverage for various lengths of time. The policy language will generally discuss what different time periods can be purchased and provide an idea of what the related cost is for the endorsement. The premium generally is a calculation based on the lawyer’s last annualized premium. The lengths of time may include one year, three years, six years, or unlimited (for retiring lawyers). Depending on the areas of practice, a lawyer may want to consider an unlimited endorsement. For lawyers continuing to practice, the available time periods generally are more limited and might only include options such as three years and six years. An alternative to purchasing an ERP endorsement or tail coverage is asking an insurer to provide “prior acts coverage.” Generally, this scenario exists when a lawyer leaves a job and is moving to a new firm or beginning his or her own practice. When taking that new position, the lawyer can ask the new employer to have the firm’s carrier consider providing coverage for all the lawyer’s prior work. Lawyers striking out on their own and starting a new practice also can ask an insurance carrier to consider providing prior acts coverage. Liability limits for legal malpractice insurance policies are offered at many different levels. Policies typically start at $100,000 per claim, $300,000 aggregate (multiple claims in the same policy year). Roughly one-third of WILMIC’s policyholders obtain that level of coverage, making it the most common. The next level of liability coverage is $250,000 per claim, $750,000 aggregate. Half of WILMIC’s policyholders carry one of those two liability limits. Nearly 90 percent of WILMIC’s policyholders carry liability limits of $1 million or less. Some policyholders carry limits as high as $10 to $15 million, and many carriers offer limits higher than that. When deciding what amount of coverage is appropriate for your firm, you should start by considering the type of legal work you do, the amount of assets you want to protect, and what level of coverage gives you adequate peace of mind. If you work on multimillion dollar corporate transactions, for example, $100,000 in coverage would obviously not be enough. What type of matter should I report? The existence of a claim (allegation of a mistake and a demand for payment) is usually obvious. For example, when a client alleges that you made a mistake and demands restitution, a claim exists. The recompense sought by a client could range from return of the fees he or she paid you to payment of financial losses allegedly suffered. Other matters may be more subtle and you may be either reluctant or unsure of whether to report them. For example, in reviewing a file, you may discover a problem of which no one else is aware. Although you might want to look the other way, you have a duty under the terms of your policy to inform your insurance carrier immediately. Looking for malpractice carriers? Visit WisBar’s Classifieds. Look for the listing of Professional Services & Experts at www.wisbar.org/classifieds. It provides coverage for matters first made against you and reported in writing to the insurance carrier during the policy period. com joe.mccarthy wilmic Joe McCarthy, U.W. 1993, vice president of underwriting, Wisconsin Lawyers Mutual Insurance Co., Madison. When should I report a matter to assure coverage? When you first become aware of a matter that a reasonably prudent lawyer might expect to be the basis of a claim, you must notify the insurance carrier in writing. What if I can fix the problem? Not reporting a matter during the policy period in which you became aware of it could void coverage. Under most policies, an attempt by a lawyer to unilaterally remedy a problem or simply pretend that it does not exist could jeopardize coverage. The existence of a claim (allegation of a mistake and a demand for payment) is usually obvious. For example, when a client alleges that you made a mistake and demands restitution, a claim exists. The recompense sought by a client could range from a return of the fees he or she paid you to payment for financial losses allegedly suffered. Other matters may be more subtle and you may be either reluctant or unsure of whether to report them. For example, in reviewing a file, you may discover a problem of which no one else is aware. Although you might feel like looking the other way, you have a duty under the terms of your policy to inform your insurance carrier immediately. What if I think the allegation is frivolous? As a condition of coverage, you have the duty to report any circumstance that could give rise to a claim, regardless of whether you believe the matter is defensible. Even if the matter is without merit, by reporting it to your insurance carrier you have done your duty and have triggered protection just in case the matter later mushrooms into a problem. Why is timely reporting important? What happens if a known matter is reported after my policy expires? Coverage is only provided if a known matter is reported, in writing, to the insurance carrier before the policy expiration date. Once your policy expires, coverage terminates, regardless of when you performed the professional services. If, after a matter is reported to an insurance carrier, it is determined that you knew or should have known of a matter that could potentially become a claim – based on the reasonably-prudent-lawyer standard – then coverage could be contested. Will my reporting of any matter automatically tarnish my insurance record? Underwriters for a reputable insurance carrier will look beyond the existence of a reported claim and consider several factors. Will a costly claim mean that I will be dropped by my insurance carrier? Will my premium increase when I report a claim? The above factors are considered and input is received from the claims department. WILMIC makes every reasonable effort to avoid premium increases. On the other hand, lawyers with no claims or less costly claims can rightfully expect to pay lower premiums than lawyers with significant claims.